No Pain/Discomfort: The entire treatment is finished in record time with absolutely no pain during and after .Since it is a flapless procedure , there is no sutures, no swelling. Patients resume their normal activities that very day itself. The way Dr. Turner and associates are able to provide implant Teeth-in-an-Hour is by using precision surgical techniques combined with sophisticated computer technology. 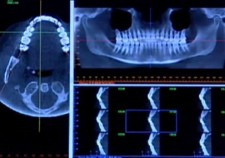 Using a CT scan of your jaw structure and three-dimensional computer imaging technology, the exact placement of the implant abutments is planned out before your appointment.. The treatment plan is now sent to Sweden via modem and a precise surgical guide (NOBEL GUIDE*) is created which arrives back in their Mumbai office in 5 days. 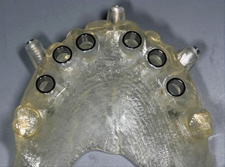 A precise surgical guide(NOBEL GUIDE*) is thus created, and then then implants are placed in a precise position through the guide for optimum esthetics and function. 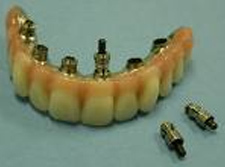 Since so much time and effort is spent in the planning phase and it is so precise, the actual surgical appointment goes fairly quickly.NOBEL GUIDES *were created through the scientific efforts of biomedical engineers to assist reconstructive dentists in providing the best prediction factor for implant success for practically all types of tooth replacement needs. Ordering the Nobelguide* from Sweden. The major benefit to the patient is the incredible accuracy and predictability of implant placement compared to ‘freehand’ implant placement. This is especially important when the patient has less available bone height and width. 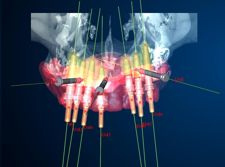 Wider and longer implants can be placed very safely depending on the available bone without risking any vital structures. An esthetic restoration is delivered to our patients on that very day itself not 4- 6months later as in traditional implant procedures and our patients leave the office with a new set of teeth .This is very rewarding for our patients! Lesser office visits , since the restoration is given to the patient on the day of implant placement. 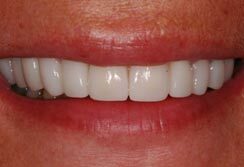 10 implants placed in the upper arch with guided surgery Individual All Ceramic CAD/CAM crowns cemented.